The lighthouses of Clarks Point have served as important navigational aids to generations of mariners. The first lighthouse was built of wood in 1797 and financed by New Bedford's merchants to help guide their ships safely into port. The lighthouse burned a year later but was quickly rebuilt and turned over to the federal government in 1800. After another fire in 1804, it was rebuilt of rubble masonry. In 1869, the light was placed atop of Fort Taber. Records indicate that the signal of the first beacon and its replacement atop the fort was "fixed white." Listed as Beacon #120 in the federal lighthouse records of 1875, Clark's Point Light is 59 feet high from its base to the focal plane, rising 68 feet above sea level. Clark's Point Light shone from atop Fort Taber for almost three decades before Butler Flats Light Station in the outer harbor replaced it in 1898. The lightkeeper at Clarks Point was Capt. Amos C. Baker, Jr., a retired New Bedford whaling master. Baker became the first keeper at Butler Flats and served there to 1911. Clark's Point Lighthouse and Fort Taber were officially designated a National Register District on February 8, 1973. 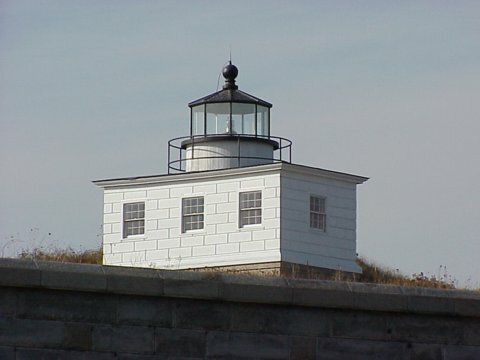 In 2001, the City restored and re-lighted Clark's Point Lighthouse during a gala evening ceremony, which featured the New Bedford Symphony Orchestra, cannon volleys and fireworks. Fort Taber Park, with its buildings, fort and the lighthouse is owned and operated by the City of New Bedford. Restoration of the Lighthouse, which stands independent of the fort's earthen roof, concluded the city's initial phase of exterior work to the fort. The light is notcurrently open to the public, pending refurbishment of the fort. The illuminating apparatus at Clark's Point Lighthouse is a U.S. Coast Guard approved marine beacon, registered as a private aid to navigation. It is a new 250mm clear acrylic lens with a nominal range of 9 nautical. Like the original beacon, it is of the Fifth Order and is "fixed white." Take Interstate 195 into New Bedford. Take the exit for Route 18 South, exit 15. Stay on Route 18 for 2.5 miles then take a left onto Cove St.
Take Cove St. for 0.4 miles and turn right onto East Rodney French Blvd. Stay on East Rodney French Blvd for 1.3 miles. Head to the parking area of Fort Taber Park.